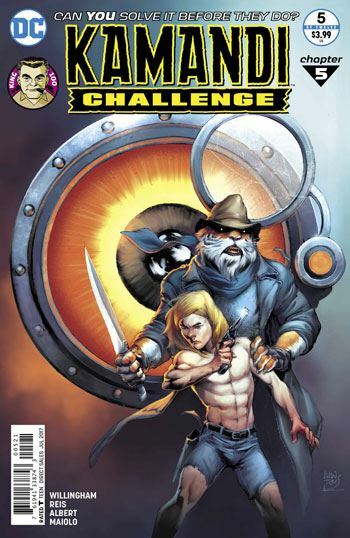 Bill Willingham, Ivan Reis and Oclair Albert are up to the task of the Kamandi Challenge in issue 5. The art on this issue is absolutely superb. Each and every page is a visual feast. Willingham finds a decent way out of last issue’s cliffhanger, which to be honest I didn’t think was very difficult. But the one he sets up at the end of this issue is pretty much mind melting, a truly horrific to look at. Between the start and the end, Vila plays a very important role in keeping Kamandi alive. Reis and Albert do such an exceptional job on rendering the plant woman. While in Kirby’s Kamandi the various animals were all quite separated, staying among their own kind, in this issue Willingham introduces the reader to a crew of mixed species, who work together on a ship. The story acknowledges the unusual nature of this, but doesn’t really expand or develop the notion, where it could have easily made some decent commentary about segregation. 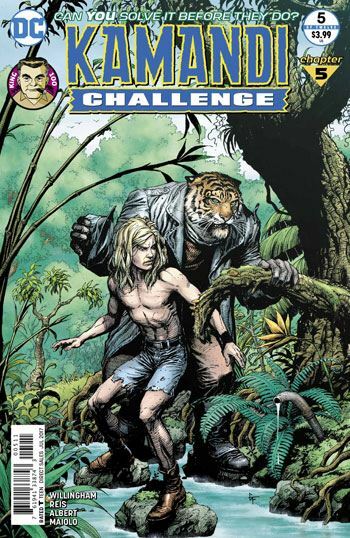 The later part of the story pairs Kamandi up with a chatty tiger, a former wrestler turned detective, Roaring Raja. Raja is a real delight, and after some very sad moments with Vila, a needed lightener for the story. And, you know, once you have the audience smiling and enjoying the tale, it’s so much easier to cut their heart out.